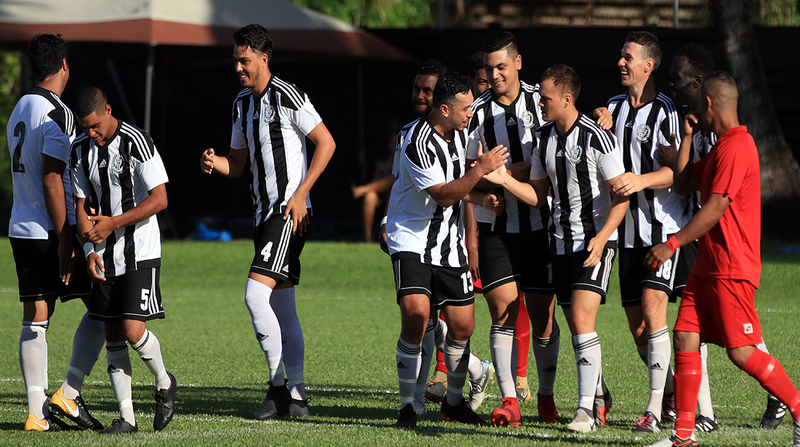 Local favourites Tupapa Maraerenga FC took a huge step towards booking their ticket to the Group Stage of Oceania’s top club football competition by making it two wins from as many games while the qualification hopes of American Samoa’s Pago Youth are all but over following another thrilling day of action at the 2019 OFC Champions League Qualifier in the Cook Islands. Cheered on by their vocal home support Tupapa Maraerenga wasted no time to grab the lead in their top of the table clash against Tongan representatives Lotoha’apai United as Jared Colligan latched onto a cross inside the box before netting in the opening minute. Knowing a win would all but secure a spot in the Group Stage, the hosts kept probing the Tongan’s defence and they were soon rewarded with a penalty which was cooly put away by Ben Mata in the 7th minute. Despite Tupapa’s relentless dominance the impressive Lotoha’apai keeper Semisi Otukolo played a huge role in keeping the hosts at bay for the remainder of the half before the Tongan champions produced a slick passing move to make it 2-1 against the run of the play two minutes before the break. A far more evenly contested affair developed in the second half with chances coming thick and fast at both ends before Grover Harmon restored the hosts’ two goal cushion in the 59th minute and Ben Mata put the result beyond any doubt four minutes later. Any hopes of a Lotoha’apai comeback were dashed with a red card to Sione Uhatahi for a second bookable offence before Ben Mata was also shown a straight red in the 87th minute as both sides finished the match with ten men. Tupapa players have embraced as the final whistle blew knowing that barring a miracle this victory had booked their place at the next stage of the region’s premier club football competition, while Lotoha’apai is now facing a winner takes all clash with Kiwi FC on the third and final match day if they want to secure the last available place on offer. Tupapa coach Delaney Yaqona gave plenty of credit to their Tongan opponents. “We are definitely very happy and all heads off to Lotoha’apai, they came out here and they gave us a good game. “We had a really good start and things were flowing from there but all credit to them as they came back and stuck into us and we had to pick our game up and do things a bit better to win in the end,” Yaqona explained. Meanwhile his Fijian compatriot in charge of Lotoha’apai lamented his side’s slow start to the game. “Those two early goals, they were our downfall today. “I’m still happy with the performance even though we conceded two goals in the first ten minutes, it was a slow start and we have to accept what the result is,” Lui Muavesi summed up.